It’s time for the next challenge over at Seize the Birthday! This time our topping is Leaves. As soon as I saw the November challenge over at The Verve blog was to use Vellum, I decided this would make a perfect pairing! I was right…. it came together just as I had envisioned or maybe even better! Don’t you just love when you are happy with what you have created? It doesn’t happen as often as I would like, but it happens generally when I start doubting myself and my work! 🙂 Anyhoo, Let me tell you a little about my card! The stamps are all from Verve! Have I said lately how much I love VERVE? Well, I do! The flower is my very first stamp I ever got from them. It’s called Elegant Flower- Plain Jane. The sentiments are from the Poppy Birthday set. I thought the sentiments look great on those banner dies. The vellum leaves are a sizzix die that I have had for so long, but had never used before because they didn’t work in my Cuttlebug. I finally broke down and bought myself a Big Shot…and I am very happy I did. It’s about time I get up a little more with the times. I then ran them through my Lattice embossing folder. I heat embossed the flowers with some Blushing Pink Pastel powder and fussy cut them. I just love the way they came out. Some pop dots and some bling and I was finished. I couldn’t decide on which photo to use so I used both! Still working with that camera! I think some days I am improving…what do you think? Now you have two places to stop by: Seize the Birthday where we are always celebrating Birthdays and our Topping option is Leaves and or The Verve Blog where they are asking us to use some Vellum on our project. Hope you find sometime to be creative! Categories: Cards | Tags: Card making, Cards, Happy Birthday, rubber stamps, stamping, vellum, Verve Stamps | Permalink. So gorgeous in all the pink colors. Very lovely with all those layers and elegant flowers. This is gorgeous Nancy. I love the vellum leaves. That Verve flower is one of my favorites too. The color combo is perfect. Great job my friend. This is so pretty, Nancy. I love the look you got from embossing the vellum. It’s too bad you bought a Big Shot to use the die. I’ve used Sizzix dies with my Cuttlebug but you have to alter the layers. I also love the sentiments. Adore this Nancy!! 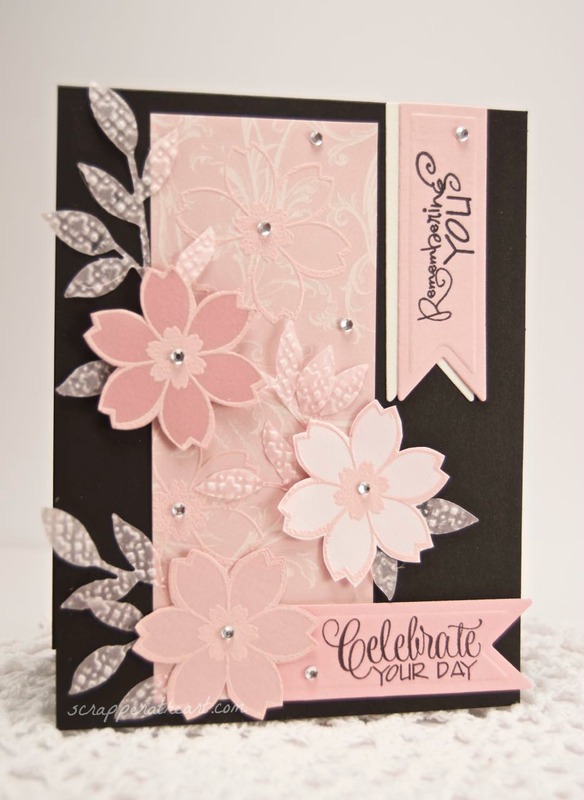 Gorgeous colour combo, love the double tab, embossed vellum leaves – everything! Way to flash the Verve 🙂 Hugs to you! This is so adorable! I absolutely love those gorgeous flowers and the soft pink colors! Oh, my! This is so stunning. 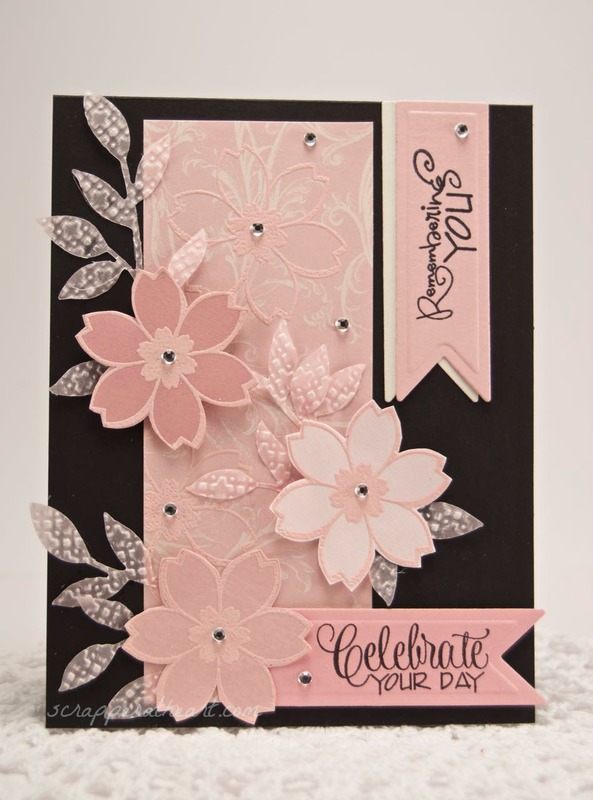 Love the pink and black and those vellum embossed leaves are gorgeous! Thanks Julee…coming from you …this made my day!! Thanks for inspiring me! This is just stunning, I am loving the soft pink on the bold background. Such a visual statement! Absolutely STUNNING! Love the vellum and the fabulous layout.